Whether power tools, cutlery, or appliance, our stainless steel assets are highly valuable to us. And although the name “stainless” implies that your steel will be tarnish-resistance, it is not. Instead, it is a chromium-based metal that can easily corrode if it is not properly maintained. So when you first see the signs of rust formation, it is only natural to feel disappointed and frustrated. But there is no need to worry about rusty stainless steel, because it can be removed and prevented using the proper methods. Continue reading to learn what causes rust to form, as well as, how to remove rust from stainless steel. By understanding the process of rust formation on metal, particularly stainless steel, you can better protect your possessions from such tarnishing in the future. Rust formation on metal is known as oxidation, which fundamentally occurs as a result of oxygen exposure. In the case of stainless steel, when chromium is exposed to oxygen, it forms an invisible layer around the exterior known as chromium oxide. This layer of chromium oxide is actually an advantage, as it protects the outer surface of the steel from stains and you guessed it, rust. This is where lack of maintenance can become an issue. You see, when stainless steel is not properly cared for, this layer of chromium oxide will be prone to damage; and if it is damaged, it provides the opportunity for rust to form. What can damage the chromium oxide layer? Using the wrong cleaners, such as ones that contain alcohol or other harsh chemical substances, can quickly rip the layer away. Solutions that contain ammonia or mineral spirits can also cause a significant amount of damage to the protective layering. 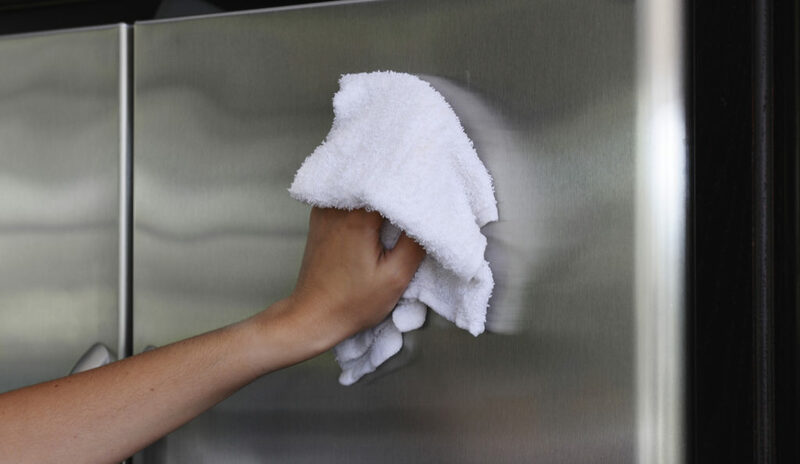 I tis important to use the proper methods to clean your stainless steel to avoid jeopardizing the structural properties of your stainless steel. All surfaces require daily, weekly, and periodic cleaning, and your stainless steel is no different. On a daily basis, you should be gently wiping the surface using a microfiber cloth and warm water. This will eliminate and manage dust, dirt, debris, and fingerprints. For dirtier surfaces, or on a weekly basis, use a mild dish detergent and warm water to cleanse the metal. Then rinse with fresh water and dry thoroughly with a clean, dry rag. Store-bought stainless steel cleaners are also effective and safe. On a periodic basis, such as every 3 to 6 months or so, it is wise to polish your stainless steel. This is especially important for appliances and fixtures, like refrigerators, dishwashers, ovens, faucets, and sinks. Use can use a store-bought stainless steel polishers, such as disposable wipes or liquid solutions. To remove small or minor areas of rust from stainless steel, you will need 1 tablespoon of baking soda and 2 cups of warm water. Combine these two ingredients to make a paste, and then apply it to the affected area in the direction of the grain using a circular motion. Use a damp paper towel to rinse the area clean. For larger areas of rust, see our blog, “How to Clean Rusty Stainless Steel” for a full step-by-step instructional guide. Recycle Stainless Steel Appliances in Indianapolis! Call Zore’s Recycling at 317-244-0700 for information about appliance recycling in Indianapolis, Indiana. We pay cash on the spot for junk metal, including appliances, electronics, motorized vehicles, construction equipment, power tools, and more! Whether you need to get rid of an old fishing boat that no longer works or is worth repairing, or need to make money from a totaled car, we are the place to start! Request free estimates and information, anytime. This entry was posted in Appliance Recycling and tagged appliance recycling Indianapolis, How to clean Stainless Steel, junk appliance buyers Indianapolis, remove rust sink, remove rust stainless steel, Rust removal stainless steel. Bookmark the permalink.